Nick Espinosa hosts The Deep Dive. The show details how to keep your personal information secure at home and on the internet. 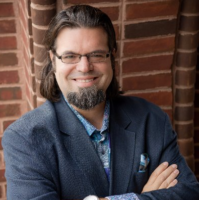 An expert in cybersecurity and network infrastructure, Nick Espinosa has consulted with clients ranging from the small business owners up to Fortune 100 level companies. Nick founded Windy City Networks, Inc at 19 and joined forces in 2013 with BSSi2. In 2015 Security Fanatics, the Cybersecurity/Cyberwarfare division of BSSi2 dedicated to designing custom Cyberdefense strategies for medium to enterprise corporations, was launched. Regular columnist, member of the Forbes Technology Council, on the Board of Advisors for both Roosevelt University’s Center for Cyber and Information Security as well as Bits N’ Bytes Cybersecurity Education, award winning co-author of a bestselling book, and host of The Deep Dive radio show, Nick is known as an industry thought leader and sought after for his advice on the future of technology and how it will impact every day businesses and consumers. Click on the “Shows” button in the right column of this page to view the “The Deep Dive” broadcast schedule. Listen Below to Previous Broadcasts of The Deep Dive that interest you.